The Hangover 2, the sequel to 2009’s summer comedy blockbuster, The Hangover, grossed $86.5 million in its opening weekend, Memorial Day 2011, making the film the best three-day weekend opener for a live-action comedy. The film made over $135 million over its first five days in the United States, more than double what the original Hangover made. It also broke three-day, four-day, and five-day opening box office returns, and is the fastest comedy to gross $200 million worldwide. The sequel, like its predecessor, revolves around a picaresque series of comedic exploits, largely fueled by alcohol and chance, that a group of friends find themselves in. This time, the gang, Phil (Bradley Cooper), Stu (Ed Helms), Alan (Zach Galifianakas), and Doug (Justin Bartha) have traveled to Bangkok, rather than Las Vegas, to search out adventure and camaraderie before one of their party (Stu) gets (re)married. I don’t think I’m spoiling the plot by saying that things quickly go awry and shenanigans ensue. 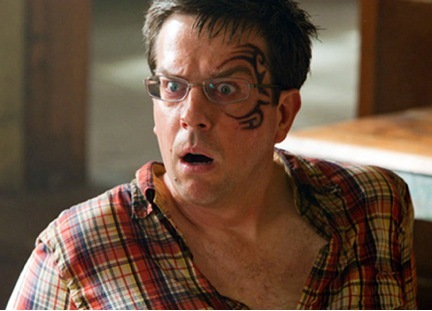 One notable plot point involves Ed Helms’ character receiving a facial tattoo identical to Mike Tyson’s. For the unusually mild-mannered Stu, this is an extreme and out-of-character decision, as it would be for the film’s target demographic, young American men. The stakes are particularly high for Helms, as he is scheduled to get married shortly upon his return, and to a woman who would not appreciate this newly acquired ink. 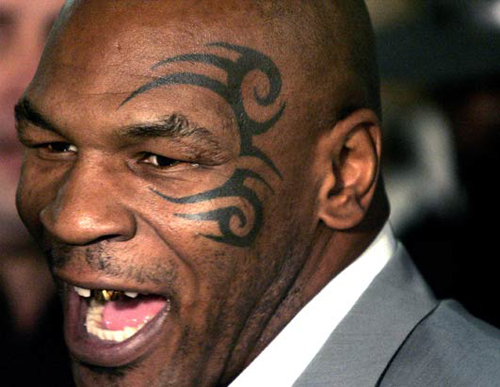 The fictional tattoo sported by Helms has recently received media attention from the court case brought by Victor Whitmill, the tattoo artist who created Mike Tyson’s facial tattoo. Whitmill is suing Warner Bros. for copyright infringement, stating that he was not contacted by the studio for permission to reproduce his design. Whitmill had sought damages and an injunction to prevent the film from opening. Warner Bros. is contesting the suit, saying that the studio, the film, and its promotional materials are protected under fair use laws that cover parody. While the judge on the case ruled that the film could open on time, the copyright lawsuit is being allowed to go forward. While Whitmill’s case is a challenge to copyright law, it is not the first time that tattoo artists have claimed copyright over their designs that appear on celebrity clients. In 2005, tattoo artist Matthew Reeds sued basketball star Rasheed Wallace and Nike to stop using the design he created for Wallace in a promotional biographical video for the Nike Corporation. The commercial  simulates the creation of the tattoos on Wallace’s arms through animation. In another case, UK tattoo artist Lou Molloy threatened to sue David Beckham if he chose to engage in a promotional campaign that featured Molloy’s famous “Guardian Angel” tattoo that appears on Beckham’s back. Both cases were settled out of court. It is also not the first time that this tattoo, Whitmill, and Tyson have been in the news. In 2003, Tyson got the facial tattoo, a stylized version of a New Zealand Māori moko. Traditionally, ta moko, or facial tattoos, were the domain of Māori ariki, or chiefs. These designs were uniquely personal to the user, and were administered by a tohunga, a ritual specialist. Māori responses to Tyson’s tattoo were a mixture of ambivalence and outrage, for neither Tyson nor Whitmill had been properly authorized to wear or administer the design. Like Robbie Williams before him, who also sports a Maori-inspired tattoo that inspired similar umbrage, Tyson seemed to have little more than passing knowledge of Maori culture. If the copyright case goes forward, it remains to be seen how the Māori component of Whitmill’s design will be taken into account with regards to his claim to original authorship, and how the U.S. court system will address the legality of Whitmill’s negligence in following Māori protocols. Online speculation favors out of court settlement, so these questions of potentially reconciling international Indigenous copyright laws with American domestic artistic copyright and parody laws may be more hypothetical than legal reality. Tyson starred in the first Hangover as a (presumably) hyberbolic version of himself.